The Haib deposit has a distinct surface expression with abundant copper staining on fractures and joint planes, particularly in and around the dry river bed of the Volstruis River. This led to German prospectors identifying the deposit around the late 1800s or early 1900s. Small tonnages of high grade copper carbonate ore were mined at this time. After World War II, the prospect was pegged as claims by prospector Mr. George Swanson who carried out small scale mining and tank leaching operations. 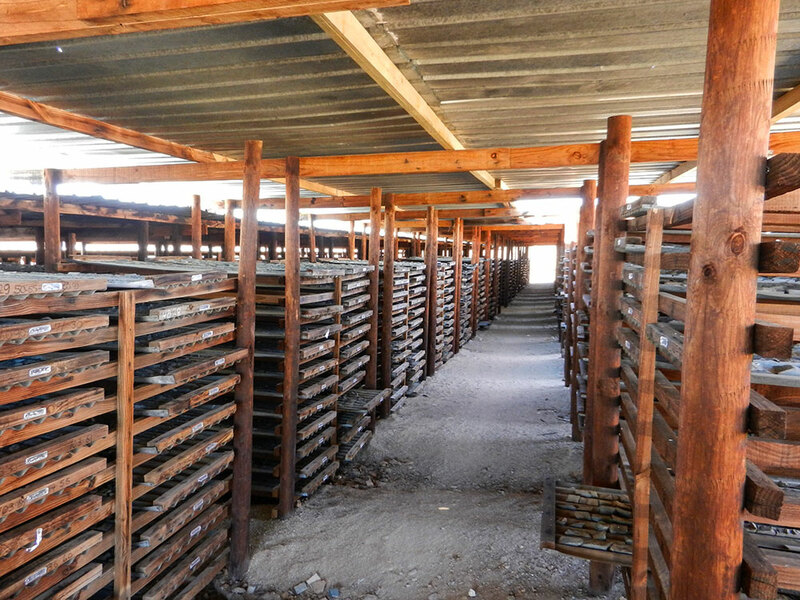 Over 6,000 tons of hand sorted high-grade copper ore were sold to the O’okiep Copper Mines, across the border at Nababeep in South Africa, reportedly at grades of up to 18% Copper. In 1963 - 1964 Falconbridge completed a moredetailed exploration programme looking at the higher grade zones within the Haibdeposit. They drilled some eleven diamond drillholes totalling 1,012 metres of drilling. The average grade of the drillhole intersections was given as 0.33% Cu. During 1968 - 1969 King Resources of South Africa Pty Ltd conducted a diamond drilling programme of 21 holes totalling 3,485 metres. They examined both lower and higher grade sulphide zones, as well as the higher gradeoxide shear zones. During 1972 – 1975 Rio Tinto Zinc (“RTZ”) conducted the first extensive and systematic investigation of the Haib deposit. Geochemical and chip sampling surveys were conducted along with IP and Resistivity surveys. They drilled one 120 diamond drillholes totalling 45,903 metres. The cores from this programme are still intact and stored in a core shed on site. RTZ sampled by compositing half cores over 2 metre intervals and submitted these for determination of total copper and where appropriate, oxide copper (acid soluble copper). Composite samples from each drillhole were also tested metallurgically to determine recoverable copper and were assayed for molybdenum, silver and gold indicating average contents of 25 g/t Mo, 0.01 g/t Au, and 0.9 g/t Ag. Tonnage and grade estimates at various cut-offs were made and a conceptual pit design was proposed. In November, 1993 Rand Merchant Bank Ltd of South Africa acquired an option over the Haib property. Venmyn Rand Pty Ltd., produced a study of the project including compilation ofall the available drillhole and assay records from previous investigations and set up a computerised drillhole database. 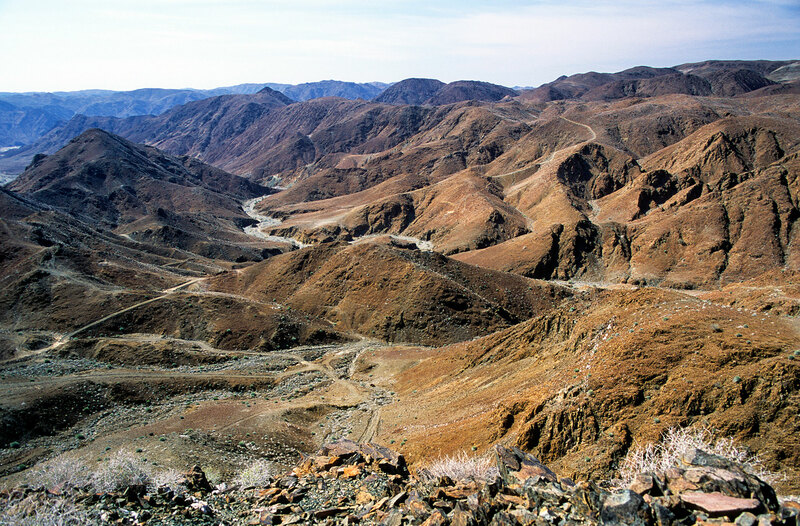 It was concluded that the increase in the copper price since the 1970’s, development of low cost / high tonnage mining systems and new and refined technologies such as bacterial leaching, solvent extraction and electro-winning combined to create a situation where development of the Haib deposit could represent an economic project; however, no further exploration work was done and work terminated in 1995. In March 1995, Great Fitzroy Mines NL (“GFM”) and RMB Mr. George Swanson signed a joint venture called Namibian Copper Joint Venture (“NCJV”). From 1995 to 1999, NCJV drilled a 12 infill holes, drilled 5 geotechnical investigation holes, completed 126 metres of excavation in an adit and two crosscuts for bulk sampling and metallurgical testing and carried out various test works including mining cost audits, bio-leaching studies, and milling and grinding studies. NCJV ran into financial difficulties and work was stopped at the Haib deposit in early 1999. In 2004, Deep-South Mining Company (Pty) Ltd (Deep-South) was granted the Exclusive Prospecting licence 3140 (EPL) was granted over an area of 74,563.0 ha covering the deposit and a very large surrounding area. This was subsequently renewed in April 2007, 2009, 2011, 2013 and 2015 with the area reduced to 37,000ha after the 2007 renewal. From 2008, Teck under the option Agreement with DSM has completed a comprehensive exploration programme at the Haib and immediate surroundings. (results discussed in the other sections below). 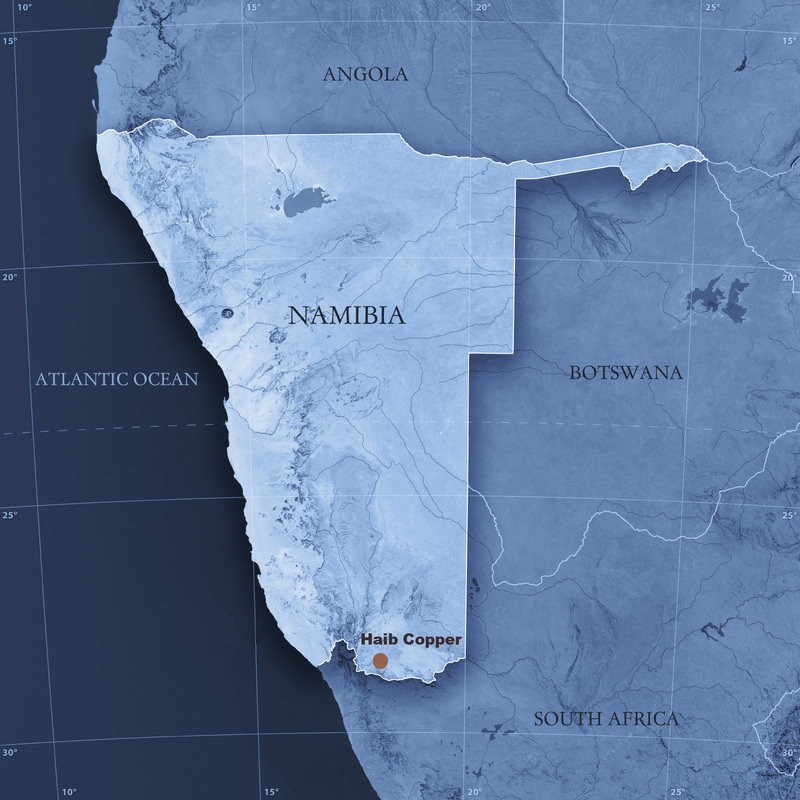 The Haib copper deposit is in the extreme south of Namibia close to the border with South Africa, which is defined by the course of the Orange River. The deposit lies some 12 – 15 kilometres east of the main tarred interstate highway connecting South Africa and Namibia and the nearest railway station is at Grunau, some 120km north on the main highway. This rail connection could provide access to either the port of Luderitz or to Walvis Bay via Windhoek or to South African ports or facilities via Upington. The Haib deposit is located within part of the Namaqua-Natal Province called the Richtersveld geological sub-province which is further subdivided into a volcanosedimentary sequence (locally, the Haib Subgroup), the Orange River Group and the intrusive Vioolsdrift suite which are closely related in space and time. 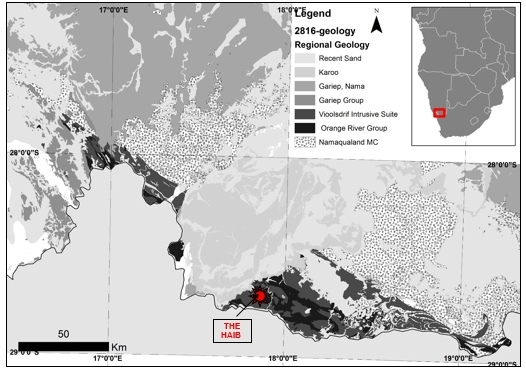 The Orange River Group is composed of sub-aerial volcanic rocks and reworked volcaniclastic sediments; deformation caused displacements along stratigraphic contacts before intrusion of the Vioolsdrift suite. The predominance of andesitic and calc-alkaline magmatic rocks with tectonic compression prevailing throughout the magmatic episode has led to an interpretation of an island-arc model for the region. Recent mass spectrography indicated an age of 1,880 Ma for the volcanics. The principal mineralised hosts at the Haib are a Quartz Feldspar Porphyry (QFP) and a Feldspar Porphyry (FP) – see Figures 4 and 5 below. The QFP is interpreted as a quartz diorite body which intruded the feldspar porphyry some 1,868 ± 7Ma . The FP is generally interpreted as being part of the suite of andesitic rocks although some workers have suggested that it too, may be partially of intrusive origin. The QFP is elongated along the orientation of the Volstruis Valley, largely coincident with the location and orientation of many of the higher grade intersections within the deposit. The sequence has undergone low grade regional metamorphism to greenschist facies which event has been dated at 1,100Ma. Most of the rock exhibits typical porphyry copper type alteration zones associated with mineralisation. A potassic hydrothermal alteration zone coincides with the main mineralised area surrounded by phyllic and propylitic alteration haloes. Propylitic and sericitic alteration appears to overprint the earlier potassic zones. Silicification, sericitisation, chloritisation and epidotisation are widespread. A 43-101 Mineral Resource estimate, has been prepared for Deep-South by P & E Walker Consultancy and Obsidian Consulting Services, both of South Africa, in accordance with the 2014 CIM Definition Standards for Mineral Resources and Mineral Reserves. The report is dated January 15, 2018. Consultancy, both of whom are the Qualified Persons for the Mineral Resource Estimates. The effective date of the estimate is January 15, 2018. Mineral Resources are estimated using the CIM Definition Standards for Mineral Resources and Reserves (2014). Table 2. Haib Copper Indicated Mineral Resources, Sensitivity Cases. Table 3. Haib Copper Inferred Mineral Resources, Sensitivity Cases. This Haib Copper Mineral Resource has been defined by diamond core drilling covering a total surface area of some 2.6 square kilometres. The mineral resource classification is closely related to data proximity. Topographic elevations within the mineral resource area vary from 320m to 640m above mean sea level and average 480m above mean sea level. Indicated resources are constrained between the variable topographic surface and a horizontal level which is 75m above mean sea level and within which the majority of the drill and assay data are constrained. Inferred resources are laterally constrained by the last line of drill holes and extend vertically from the horizontal surfaces defined by the +75m and -350m above mean sea level ( a block of 425m thickness) within which there is a lesser data set derived from drilling. The Haib Copper exploration licence provides significant potential for resource expansion, since there is known, but poorly drilled and assayed, mineralisation beyond the drill grid boundaries and below the main mineralised body (which covers some 2 square kilometres of surface area), where a few drillholes from 75m above mean sea level to -350m above mean sea level (i.e. a thickness of 425m) have shown that mineralisation is present. The deepest drillhole did not pass out of mineralised material. 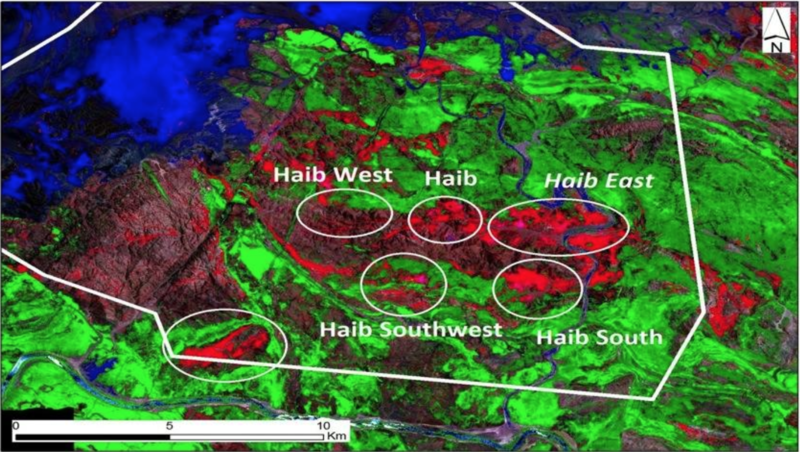 In addition (see map below), there are 5 satellite mineralised target areas surrounding the main Haib porphyry body which still require further evaluation. Map 1 – The location of the Haib porphyry deposit and satellite targets within the exclusive prospecting licence area. Peter Walker B.Sc. (Hons.) MBA Pr.Sci.Nat. of P & E Walker Consultancy is the main author of the 43-101 resource estimation report and is responsible for the technical part of this press release, and is the designated Qualified Person under the terms of National Instrument 43-101. 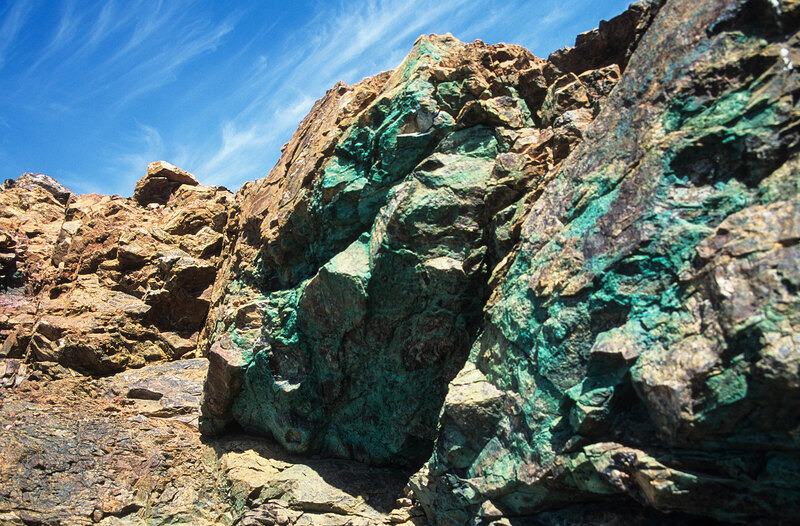 A Preliminary Economic Assessment ("PEA") has recently been completed by Mineral Engineering and Technical Services of Australia (“METS”) on the Haib Copper project in Namibia. As the operator of the project from 2010 to 2016, Teck took a more regional view of the project than previous operators. Their exploration objective was to provide the required data to show that the deposit had potential for large-scale mining, particularly if the tonnage or grade, or both, could be improved and that early stage mining could exploit sufficient high-grade mineralization to improve the economics of mining. They started a new exploration program both to investigate the open ended parts of the deposit (deep drilling and extension drilling) and to explore for new, undiscovered outlying mineralization. This had not been previously attempted. They have re-logged all of the available (108 out of 120) old RTZ drillholes in detail, again using the Anaconda method. These were all located within the Main Haib deposit. They have re-sampled 14 of the old RTZ drillholes to compare the assay results obtained by RTZ for copper and also to determine the grade of gold, silver and molybdenum. They completed some 83 line kms. of pole-dipole Reconnaissance Induced Polarization (RIP); and another 6 line km. of Audio Magnetotellurics (AMT). They have taken 636 soil samples on grid lines 150m apart with sample spacing of 50m covering an area of 400 hectare across three of the satellite targets. They have constructed a 3-D geological model of the Main Haib zone. This model combines all the surface and down hole geology, assays and geochemistry to constrain the grade envelope in a future resource estimate. The deposit is a porphyry copper-molybdenum dating from the Archean age. The Haib Cu-Mo deposit is arguably the oldest porphyry deposit in the world, which hosts easily identifiable porphyry veins and alteration. The principal mineralised hosts at Haib are a quartz feldspar porphyry and a feldspar porphyry rock. The main ore mineral at Haib is chalcopyrite, but minor amounts of bornite, chalcocite and the various green copper oxides can also be found. Oxidation is very shallow, usually less than 30m, and sulphides are common at surface. The deposit, discovered in the 1950’s, has seen over 50,000 metres of drilling in the 1970’s by companies such as Rio Tinto and Falconbridge Ltd. Since 2010, Teck Namibia completed over 14,000 metres of drilling with results such as: 121 m @ 0.5% Cu, 494 m @ 0.36% Cu and 30 m @ 0.81% Cu. GFM and Behre Dolbear models used the Kriging method as the basis for their estimate calculations. Kriging is a statistical estimation technique widely used for porphyry deposits. The other methods used by Behre Dolbear were used for validation of the estimates.Behre Dolbear report was produced from a geostatistical block model completed 1996 by Great Fitzroy Mineral by (“GFM”). The Historical Estimate comprised principally the compilation and verification of the all drillhole data incorporating all available data to the end of the Rio Tinto Zinc programme completed in 1975 and comprising over 50,000 metres of drilling. The estimates of tonnages and grades quoted in this report were prepared prior to publication of National Instrument 43-101 in 2001 and are considered as Historical Estimates. The historical grades and resources terminology from the original historical reports are to be used only as a reference and should not be considered as a current mineral resource under NI 43-101 but are to be considered as Historical Estimates as per the NI 43-101 Rules and Policies. 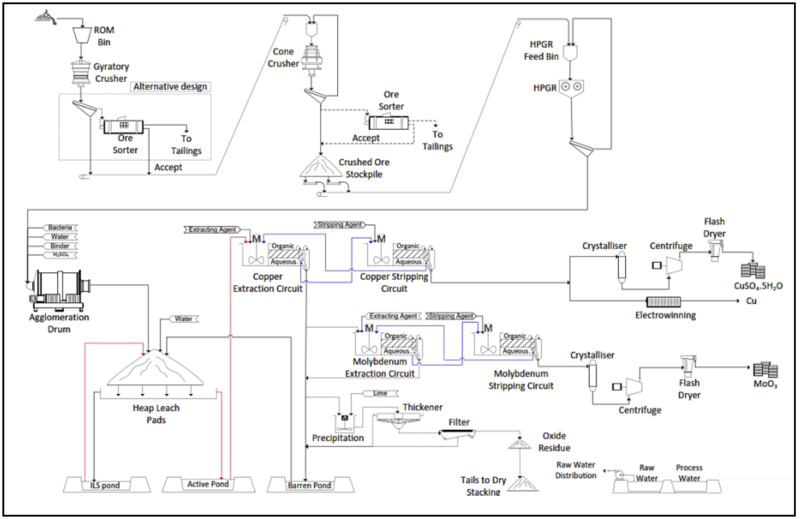 43-101 Independent Technical Review: The Haib Copper Project, Namibia.